It has been 52 years since the partial decriminalisation of homosexuality in England and Wales, and only 6 years since gay marriage became legal in the UK. Although progress comes in waves and there is still much to be done, the UK has taken great strides towards becoming a more equal society that celebrates love in all its forms. This LGBT+ history month, we’re taking some time to reflect on what love looks like internationally, with three films that explore the universal rites of passage - coming of age and first love - from a global perspective. The first film in the season, Rafiki, is a delightful film following a fizzy romance between two girls on the brink of adulthood. The film first hit the headlines in May 2018, when it became the first Kenyan film in history to be accepted into the prestigious Cannes film festival. At its premiere it received a standing ovation, and although Cannes audiences to love to stand up and clap, there was a palpable feeling in the room that this was something different. At the front of the room stood three African women, laughing and smiling through stifled tears. At a festival so frequently chastised for its lack of diversity and gender imbalances (to date, there have been only 82 films directed by women in the official competition, compared to 1,645 by men), their very presence is cause for celebration. 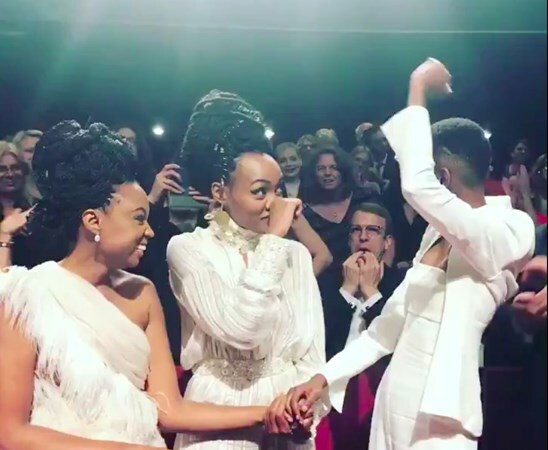 Whilst this took place, Rafiki was banned in its home country by the Kenyan Film Classification Board (KFCB), who cited a ‘clear intent to promote lesbianism in Kenya contrary to the law’ as the main cause. The ban came as a shock to many: it’s the kind of film that ignites sparks of hope in all that get the chance to see it. Perhaps this is the reason it’s perceived as so political. In September 2018, the Kenyan High Court lifted the ban on Rafiki after director Wanuri Kahiu filed a lawsuit challenging the board’s ruling. The court’s decision allowed for a seven-day theatrical release of the film – the requirements for submission to the Oscars. If you’ve been paying attention to the awards season nominations, you’ll notice that Rafiki did not get a nomination. It was, however, Kenya’s official submission for Best Foreign Language Film. For a country where homosexuality is a crime punishable by 14 years in prison, this film is truly revolutionary. It’s been starting conversations worldwide, and thanks to it’s run at a number of film festivals ending with international distribution deals, it will continue to do so. Rafiki will be officially released in the UK in April 2019, but to support the film and help spread word of mouth early, we’ll be hosting a special preview as part of LGBTQ+ History Month. Our screening will also feature an introduction to LGBTQ+ world cinema, led by Dr. Emmie McFadden.